A runny nose is a frequent condition and a common symptom of common cold, allergies or hay fever. It creates problems in breathing through the nose and if it lasts for a number of days it can be the cause of headaches or facial pain. A blocked or a runny nose will eventually cause a sore throat if not treated efficiently as well as ear pain and infections (especially in young children). The 11 methods presented below can be used to treat a running nose fast and without the use of any medication. If the problem continues for a number of days without getting relief it is best to seek the assistance of your doctor. How to stop a runny nose fast? Use a nasal spray – Consult with your pharmacist as to which spray to use and for how long. Nasal sprays can reduce the swelling of the nose and open the nasal passages. Overuse or wrong use of nasal sprays can generate the opposite results. Moisturized air – Moist air makes mucus thinner, easier to breath and softens the tissue inside your nose. The use of a humidifier in the room will produce moist and make your feel better. Saline nasal drops – A few drops every couple of hours can open nasal passages fast. You can either purchase these from a drug store or make your own by mixing 1 tablespoon of salt into a cup of warm water. Use an eyedropper, hold your head back, drop a few drops and deep breathy. Medication – There are medicines available for stopping a running nose fast but you should only use them after a doctor’s order. Stay hydrated – drink plenty of fluids and especially water to keep your system hydrated. Take a steamy bath – Steam will help you breath better by reducing the size of the swollen mucous membrane. Add a few drops of eucalyptus or menthol for even better results. 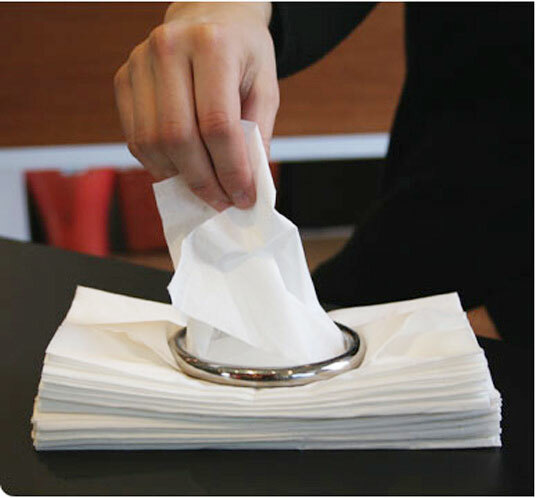 Blow your nose – Until you get relief and stop a running nose the immediate temporary solution is to blow your nose gently using a moisture tissue. Prevent the spreading of bacteria – For your own safety and for preventing the spread of bacteria make sure that you wash your hands thoroughly especially after blowing. Avoid cold weather – If you suffer from a runny nose the symptoms will get worse if you go out to cold weather. It’s not the temperature that will worsen the situation but cold air entering your mouth or nose. Make sure that your face is insulated when are out in cold weather and avoid windy conditions as much as possible. Onion Tea – FAO (Food and Agriculture Organization of the United Nations) suggests drinking onion tea as a way to cure a blocked or running nose. Basically you put ¼ of an onion into a cup of hot water and leave it to for 5 minutes. You then remove the onion and drink the liquid. Chicken soup – Hot soups can keep the body hydrated while the vapors can help open nasal passages. The ingredients of a chicken soup in particular can reduce the swelling of nasal cavities and they also provide the body with protein, necessary to support the immune system to build antibodies.